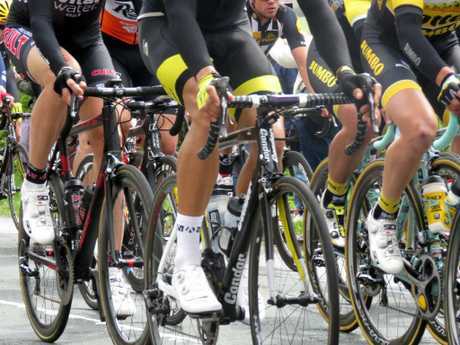 THOUSANDS of cyclists from Australia and around the world are set to roll into Queensland for the inaugural Tour de Brisbane next year. A Union Cycliste Internationale-sanctioned Gran Fondo event that caters for riders of all levels and ages, the Tour de Brisbane on April 14 will be the showpiece event of next year's Brisbane Cycling Festival. The festival is set to inject millions of dollars into the state economy, with the Tour de Brisbane complemented by a host of track events at the Anna Meares Velodrome at Chandler, including the national championships and the Six Day Cycling series final. 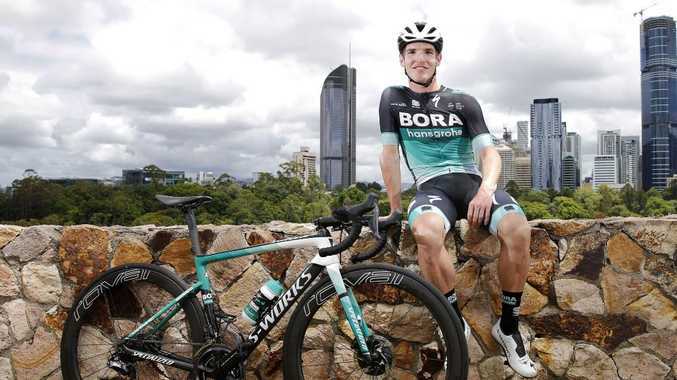 Proud Brisbane cyclist Jay McCarthy, who has competed in the Giro D'Italia, Tour de France and Vuelta A Espana, said sports fans would not be disappointed by the calibre of competitors coming to Brisbane for the March 28-April 14 festival. "With the depth of events that are on offer at the Brisbane Cycling Festival, Brisbane can expect to see the best riders from Australia and the world from both track and road to be in town," McCarthy said. "I encourage everyone to mark the (festival) on their calendar, and make their way to Brisbane and enjoy riding on the roads where my career began." Tourism Industry Development Minister Kate Jones said the festival would build on the legacy of this year's Commonwealth Games on the Gold Coast. "Brisbane Cycling Festival is sure to attract keen cyclists from Australia and overseas, and offer an immersive festival experience for the whole family to enjoy," Jones said. Cycling Queensland chief executive Sean Muir said the festival was about "racing, riding and experiencing the city". "While it's the inaugural year of the Brisbane Cycling Festival and the Tour de Brisbane, something of this magnitude has never been attempted in Brisbane," Muir said. The highlight of the festival is the Tour de Brisbane, which will take place on scenic courses of 8km, 45km and 110km, and take in some of the city’s most iconic landmarks and sites. "It's fantastic to be part of it and putting it together, and it's an absolute game-changer for Cycling Queensland in that it really encapsulates the city in a sporting event." The highlight of the festival is the Tour de Brisbane, which will take place on scenic courses of 8km, 45km and 110km, and take in some of the city's most iconic landmarks and sites. The Tour de Brisbane has also partnered with the Amy Gillett Foundation to raise awareness of city safe cycling and the A Metre Matters campaign. "It was a really good chance to tackle the safe cycling and sharing the road message through a major event," Muir said. "That's been a hot topic of late and it will continue to be so." 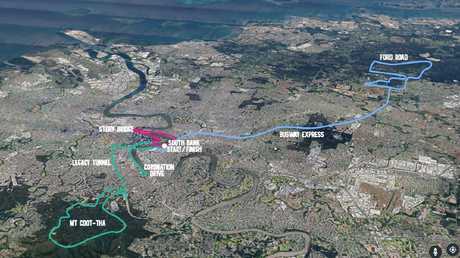 Tour de Brisbane course map. 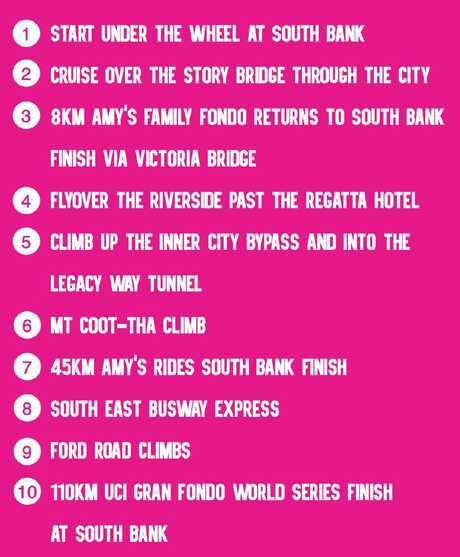 The brief was simple yet bold - create a course for the Tour de Brisbane that would showcase Queensland's capital to the world. And with that, Brisbane Cycling Festival organisers went to work to provide the most iconic route possible for the event's April 14 showcase. "With road racing that we run, you usually have to find the quietest location possible due to costs," Cycling Queensland boss Sean Muir told The Courier-Mail. "But the brief that was given from the State Government and the Brisbane City Council was all around finding an iconic course. 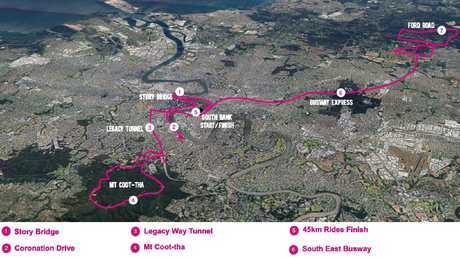 The Tour de Brisbane course created for cyclists of all ages and level have been courses of 8km, 45km and 110km. "The main aim of this one is to drive visitation as high as possible into Brisbane from Australia and around the world, and really position Brisbane as a destination for major events. "We really wanted to paint a picture on the back of a postcard that this is a promotion of 'come to Brissie and bring your back at the same time'." Created for cyclists of all ages and level have been courses of 8km, 45km and 110km. "It encapsulated the roads through the centre of the city, the Legacy Way, Legacy Tunnel, South Bank, Story Bridge, Mt Coot-tha … they're all things that are iconic to Brisbane," Muir said. 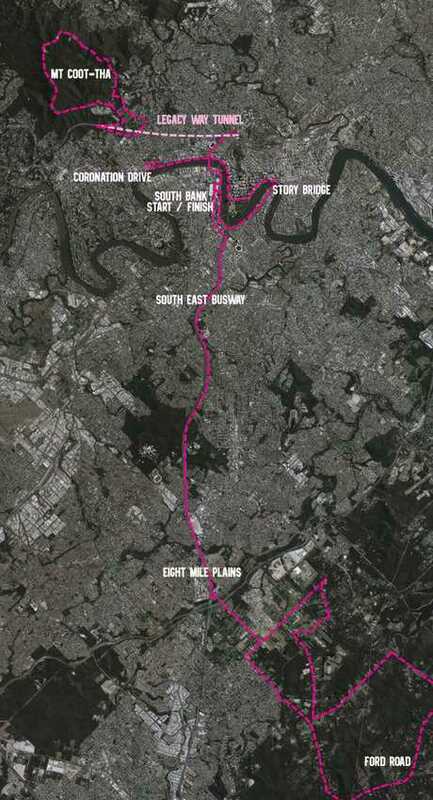 The 8km, 45km and 110km Tour de Brisbane course routes. That's not forgetting the Go Between Bridge and Coro­nation Drive as other Brisbane landmarks and roads that the course, which starts and finishes under the Wheel of Brisbane at South Bank, includes. Race director Mike Crawley said the Tour de Brisbane was "all about going for a ride, getting outside and being active" regardless of "whether you're going for a pedal or going for the podium".